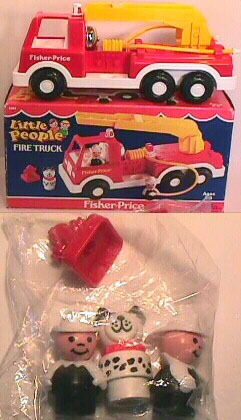 Description: In 1989 Fisher-Price introduced a new large-scale all-plastic fire truck to the Little People line. This fire truck is quite large and chunky compared to all of the other Original Little People fire trucks, and is basically the same scale as the #192 School Bus. The fire truck was sold with two firemen, a dog, and a fire hydrant. Designed for children ages 2 to 6 years old. FPT754 - Yellow 6-rung ladder BASE piece. FPT755 - Yellow ladder EXTENSION piece. 2 each - IPP - Black body firemen with white hat and arms. IAPP - Dalmatian dog with a red collar. The collar has lines on the outside edges. Other Information: This set was sold in a 12-5/16" long, 6-1/2" high, 4-5/8" deep box.